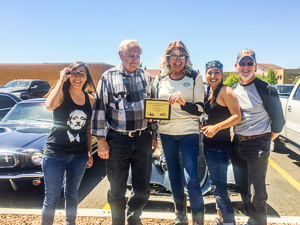 Bike and car enthusiasts enjoyed beautiful New Mexico springtime weather and raised money for scholarships at the University of New Mexico and Central New Mexico Community College at the 3rd Annual Poker Run and Car & Bike Show, sponsored by the Facility Manager Association of New Mexico. Riders and drivers travelled from Thunderbird Harley Davidson to Cort Furniture, TP Pump, Ace Asphalt, Affordable Solar, and FacilityBUILD to pick up swag graciously provided at each stop and draw scores for the chance to win best hand. 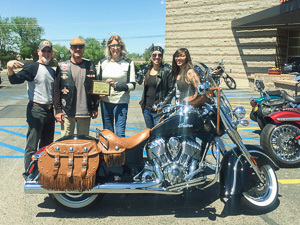 Door prizes, food, and the car and bike show trophy awards wrapped up the festivities. A diverse crowd supported the event, which added money to the scholarship funds for students entering into the mechanical trades. “See you next year!” commented Mark Awe with Burlington Northern Santa Fe Railroad facilities who attended for the first time.